Having a roof over head is one of those great milestones in any building project...feels good doesn't it. Best to square up the bottom edge and let it hang over a bit much at one end of the side. Why don't you take it off and do it over? Use a circular saw and turn the blade around backwards and you can cut a straight line along the drip edge of the tin. Just be sure to wear glasses and cut slowly. As my dad used to say "let the saw do the cutting". It is absolutely phenomenal! I could barely sleep last night from excitement! Erich --- I didn't know you could cut metal with a circular saw. We may have to get one! Daddy --- I probably should have, but I didn't realize what the problem was until we were halfway done. I don't know about tin, but when I cut rebar with a circular saw, It sents huge gouts of sparks flying about 3 feet. Kind of scary. So while you can cut the tin with a saw I would do a test run on some tin to see how sparky it is. If it is really sparky; it might not be a good idea to do it while the tin is on the roof, I would hate for you to burn down the nice building you just made. Good point! We'll probably just live with the slight unevenness --- I don't think it'll impact the function. 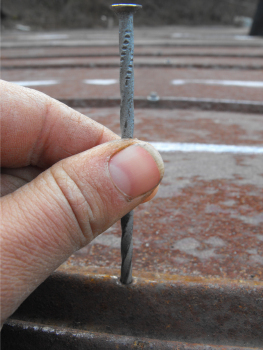 On the rebar you should be using a metal blade that grinds itself into the metal (making the sparks). On thin tin sheeting just use a wood cutting blade installed on the saw backward and it kind of just tears the tin. This is actually one of the best ways I have ever found to cut tin and won't dull the cutting blades. I'm going to have to remember that trick of turning the saw blade around backwards. So simply elegant! Some time ago I saw an interesting sheet metal sawblade on the woodworking for engineers website. It's a very interesting site if you're into woodworking. 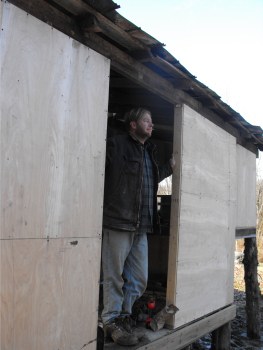 His home-made joinery rigs are quite impressive. Interesting! Thanks for the links!